SUSTAINED ENERGY: Carbohydrates like pasta provide glucose, the crucial fuel for your brain and muscles. Pasta is an excellent source of complex carbohydrates, which provide a slow release of energy. Unlike simple sugars that offer a quick, yet fleeting boost of energy, pasta helps sustain energy. LOW SODIUM & CHOLESTEROL-FREE: Pasta is very low in sodium and cholesterol-free. Per cup, enriched varieties provide a good source of several essential nutrients, including iron and several B-vitamins. Whole wheat pasta can provide up to 25% of daily fibre requirements in every one cup portion. FOLIC ACID: Enriched pasta is fortified with folic acid – essential for women of child-bearing age. FDA regulations require enriched grain products to contain this important vitamin. A serving of dry pasta supplies the equivalent of roughly 100 micrograms of folic acid, or 25% of the recommended daily intake. BALANCED DIET: Pasta is part of a well-balanced diet. Current dietary guidance calls for up to 65% of daily calories to come from carbohydrates, such as pasta. Carbohydrates - Ever wonder why it’s a tradition for athletes to eat pasta before a big race or event? 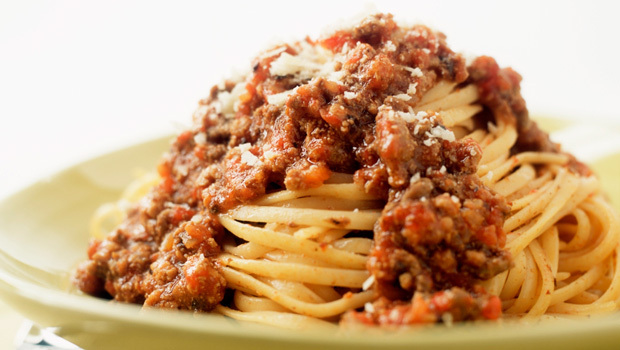 Carbohydrates such as pasta provide glucose, the crucial fuel for your brain and muscles. Pasta is an excellent source of complex carbohydrates, which provide a slow release of energy. Unlike simple sugars that offer a quick, yet fleeting boost of energy, pasta helps sustain energy. Weight Loss - Pasta is a fat-free, low sodium food that can fit right in with your weight loss plan. One cup of cooked pasta contains just 100 calories, in addition to valuable vitamins and minerals. It also fills you up so you don’t feel hungry while trying to lose weight! Pasta has a low Glycemic Index (GI) so it does not cause sugar in the blood to rise quickly. The GI measures how rapidly a carbohydrate triggers a rise in blood sugar – the higher the number, the greater the blood sugar response. A low GI means a slower rate of digestion, which can help with appetite control. Gluten - Gluten is a protein found in wheat and related grains in the wheat family like barley, rye, spelt, faro and bulgur. Foods made from wheat such as breads, cereals and pasta, contain gluten. Most people enjoy products that contain gluten without any side effects. A small group of people may have a gluten intolerance or allergy. For those individuals who have been diagnosed by a doctor with a gluten sensitivity, there are numerous gluten-free pasta options which allow them to enjoy a wide variety of pasta dishes. Individuals who do not have gluten sensitivities derive no nutritional benefit from eating gluten-free pasta and will find that traditional enriched pastas provide good nutrient value, such as iron, folic acid and vitamin B. Whole vs. Enriched Grains - Eating a balance of both whole and enriched grains is recommended by nutrition experts in order to ensure a diet rich in the essential vitamins, minerals, and phytonutrients that promotes health and helps reduce the risk of chronic disease. Both whole and enriched varieties of pasta provide a perfect foundation for healthy, nutritious, and satisfying meals. Whole Wheat or White Pasta - While whole and enriched grain pastas offer bountiful nutrients and health benefits, some people prefer white pasta (also called “refined”). Some people (and kids) favor the milder flavor and tenderness of white pasta. However, refined or white pasta is also a healthy choice, as it enriched with vitamins such as vitamin B thiamine, making it a significant source of these nutrients. I am very grateful to read your blog. Organic Products are better to use as they are eco-friendly and safe. They do not cause any side-effect. thanks for sharing the health benefits of pasta. Pasta is my favorite breakfast. I would like to read more information thanks. Thank you for the lovely words, im glad that my article was of some help.